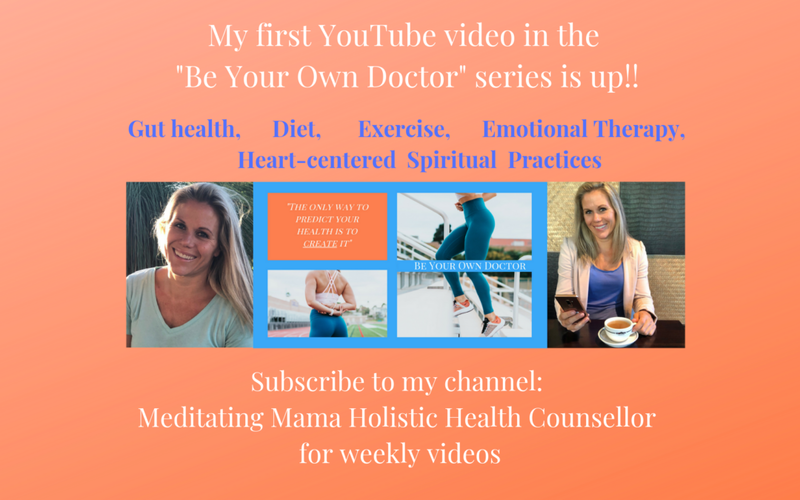 I am super excited to be re-launching my Holistic Health Youtube channel!! I have had so many requests since starting my channel 2 years ago to continue making videos, and now I am ready! As a holistic health practitioner I treat the whole person; gut, mind, body and soul purpose. With a love for everything natural and beautiful I’ve spent my life studying each of these aspects. So it has been a personal journey of self discovery with an obsession for finding peace in my heart, vitality in my body, clarity in my mind and to live a life on-purpose. Gathering a bunch of qualifications over my lifetime (check out my About page), I quickly realised there was so much more to overall health. Cue holistic health! Using neurolinguistics I am able to understand and break habits or repeating patterns. Then my personal trainer and health coach qualifications allow me to look at diet, movement and lifestyle. As an energy healer, avid meditator and long time spiritual seeker, I can see how a life has been manifest. My experience means I quickly intuit someone’s soul purpose and where they are in relation to it. Teaching practical techniques that have helped me and many other people, has been my greatest source of joy. Now my lifelong desire is to be of use to others by reaching as many people as I can to inspire, uplift, sooth and support. It makes sense that putting more time into a Holistic Health Youtube channel would be a great way to fulfill that goal. Plus I find it super fun!!! So towards the end of last year I began gathering my intel on what people want to hear about most when it comes to a Holistic Health Youtube channel. Naturally I wanted to keep to my theme of gut, mind, body, soul Holistic Health practices. And since I gobble up all the latest research when it comes to fitness, diet and gut health. I thought that would be a great place to start. A high portion of my Holistic Health clients have gut related issues. Even if they come to see me with emotional stress like anxiety, depression or chronic fatigue. We often find a poorly functioning gut is making it harder to overcome these emotional stressors. Join me in the kitchen making fermented drinks, or discussing gut health while preparing fermented foods. Then, in true Holistic Health lifestyle, we venture into meditation practices, diet and exercise. Balance in all areas is key because one thing has an effect on another. In today’s society we are likely to treat the symptom instead of the cause. I see lots of people trying to heal their gut due to IBS or food intolerances. However, if your gut is out of balance due to stress then you also want to be incorporating a meditation practice, talk therapy, energetic healing, or targeted exercise routine to ensure lasting success. Following the techniques I use in my practice, and taking on your suggestions, I have put together some of these video ideas for my Holistic Health Channel. Physical holistic health has certainly been an evolving journey for me. I can’t wait to bring you all the latest research proving shorter, less frequent exercising is where it’s at for optimum health and longevity. I also love bringing new ways to eat that leave you feeling amazing, super easily. Getting rid of cravings without willpower!! My favourite topic on earth. Because you can have the best diet, great meditation practice, exercise perfectly and STILL feel depleted if your life is off-purpose! Since we create our life, we have freedom to choose anything we want. But if we are not growing in the direction our soul is taking us, it can hurt in so many ways. In this series I will show you how you are creating the life you are experiencing and how holistic health living can support your soul journey. I will release a new video every week and am always eager to know if there are any health or wellbeing topics you would like me to talk about. To get your juices flowing, check out some of my classes or programs. If you see something you like, message me (below or privately). Don’t forget that if you want to subscribe to my Holistic Health Youtube channel and want to be notified of new releases, you will need to click that bell!